Mike's frame just shipped out yesterday, here's a cool shot of the lower head lug and fork crown. 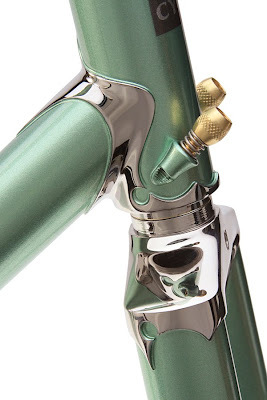 This is one of my favorite details, note how the crown is cut to mirror the lower head lug detail. There are a couple more pics of Mike's frame and fork on my Picasa page here; Ellis Cycles Picasa. You can also check out the other projects I've got in progress there and watch for updates! Just started working on two upcoming Ellis' that will feature quite a bit of polished stainless.